A Curious Contraption — Wonderful Idea Co.
For the past few months, we have been collaborating with the lovely Sarah Alexander of Cabaret Mechanical Theater, scheming up all sorts of playful ways for people to engage with the amazing world of automata (including an automata idea generator twitterbot, inspired by Paul Spooner's machine for computing the names of 13,500 ventriloquist dummies). Cabaret Mechanical Theater has a traveling show called Curious Contraptions that is making it's way around the US right now, and Sarah asked us to dream up a sign that could go along with it. I knew I wanted to make something mechanical, and Cabaret has written an excellent guide to making things move, called Cabaret Mechanical Movement, so that seemed like a good place to start. Automata use all sorts of interesting cams to get different motions, and I thought the sign could be a good place to showcase some of them and encourage visitors to look for them throughout the show. So far so good . . . the next step was making a "cam kebob" with different types of cams, to see if I could make the whole word move. That seemed to work, so I added another gear and another cam kebob to animate CONTRAPTIONS, and tested it out . . .
And discovered that my plan to move CONTRAPTIONS was not going to work! I had made a kebob of eccentric cams, and thought each one could lift a lever with a letter attached to it. Turned out it was way too much weight, and the whole thing stopped working. So, time for a redesign. Now the cams were pushing the letters out, instead of trying to lift them up, and it worked beautifully. Whew! Next challenge, we realized that having the wooden gears exposed could be a pinch hazard (and who can resist touching things? I know I would be tempted). I switched the design around to place the gears on the inside of the box, still visible, but out of reach. 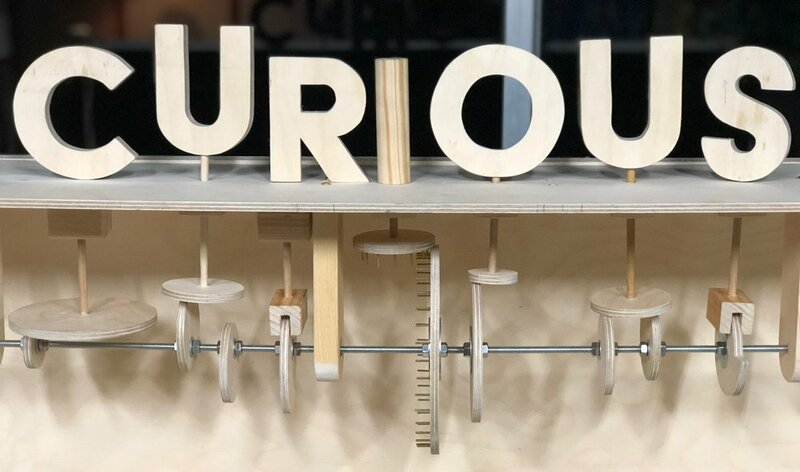 Hopefully this sign will be a nice invitation to the Curious Contraptions show, inspiring visitors to look closer, and to make their own curious contraptions in the cardboard automata workshop. I just packed the sign into a crate, and it's on it's way to Albuquerque right now. If you are in the area, go see the show at Explora! It opens February 17th, and runs until May 20th, and the automata are amazing.